By Zirny Lisiy Dmitriy: WBC heavyweight champion Vitali Klitschko (42-2, 39 KO’s) has his sights set on former WBA heavyweight champion David Haye once Vitali gets done dispatching challenger Tomasz Adamek (44-1, 28 KO’s) on September 10th. Vitali isn’t happy with Haye’s mouthing off and wasn’t satisfied with Haye’s 12 round decision loss to IBF/WBO heavyweight champion Wladimir Klitschko on July 2nd. Vitali wants to improve on his brother Wladimir’s performance by knocking Haye out if he can the British heavyweight to fight him. It sounds like Vitali wants to put Haye out of his misery. He might as well do this, because Haye isn’t going to get a fight against Wladimir again. 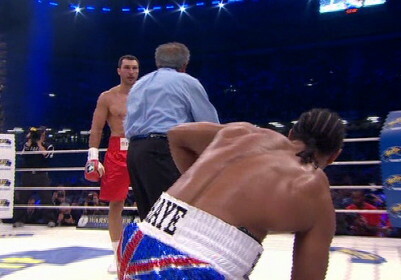 There’s no interest from Wladimir’s side in fighting Haye again and wasting precious time. Haye wants to get another big payday before he retires from boxing. Vitali is Haye’s only option for that big payday unless Haye wants to take a lesser fight and get a smaller payday. Haye can make good money fighting other heavyweights, but there won’t be the big money nor the built in excuse if he loses like there would be if he fought Vitali. Losing to Vitali isn’t something to be ashamed of, because he’s considered one of the two best heavyweights in the division next to his brother Wladimir. But if Haye gets beaten by someone like Robert Helenius or Alexander Povetkin, not that he would ever face those guys, then he would take a lot of criticism. The money isn’t as good facing other heavyweights. Haye just needs to man up and accept Vitali’s challenge. I doubt he will.